There are still a few seats available for the St Petersburg String Quartet concert taking place in Milborne Port, 11 July at 11am. The St. Petersburg Quartet is one of the world’s most esteemed chamber ensembles. Their rise to fame has included a Grammy nomination, “Best Record” honors in both Stereo Review and Gramophone, an opening night performance at Mostly Mozart at Lincoln Center, a five-year residency at the Oberlin Conservatory of Music, and hundreds of concerts on many of North America, Europe and Asia’s most prestigious series and festivals. 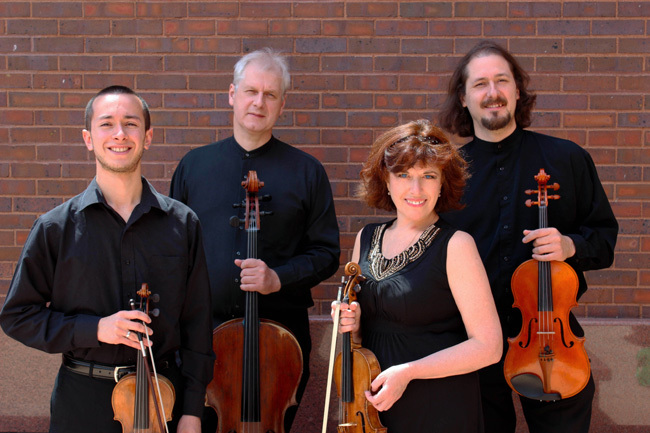 Their current season includes a performance at Carnegie Hall; a six-concert series at New York City’s popular BargeMusic Series, where they will perform the complete Shostakovich cycle; a collaboration with the Naumberg Piano Competition winner Anton Nel; three concerts at the Los Angeles Music Guild; tours of England and France; and concerts in Connecticut, Florida, Texas, California, Louisiana, Kentucky, Kansas, Idaho and Mexico. Founded in 1985 as the Leningrad String Quartet, the SPSQ blazed a trail through chamber music circles, winning a number of prestigious international competitions including 1st Prize at the All-Soviet Union String Quartet Competition; Silver Medal and a Special Prize at the Tokyo International Chamber Music Competition, 1st Prize and both Special Prizes at the Vittorio Gui International Competition for Chamber Ensembles in Florence, Italy, and First Prize and the “Grand Prix Musica Viva” at the Melbourne, Australia International Chamber Music Competition.” When the city of Leningrad resumed its historic name, the quartet changed its name to the St. Petersburg String Quartet. In 2009 the St. Petersburg Quartet launched the St. Petersburg International Music Academy, an intensive summer program for students, which they bring to various campuses and festivals in the USA and Mexico. In 2010 St. Petersburg Quartet was appointed the inaugural Quartet in Residence at Wichita State University. The latest release in the SPSQ’s extensive discography include CDs of Ravel and Debussy quartets as well as the complete chamber music works of Tchaikovsky. Alla Aranovskaya and Leonid Shukayev are founding members of the SPSQ; Boris Vayner joined in 2005 and Luis Angel Salazar Avila in 2014.